Mica is the granddaughter of our solid black stud dog, “Strongheart”, V Imo Vom Werraufer SCH III, FH , who produced for us strong nerves and excellent hip health. Her pedigree is full of powerful working dogs. 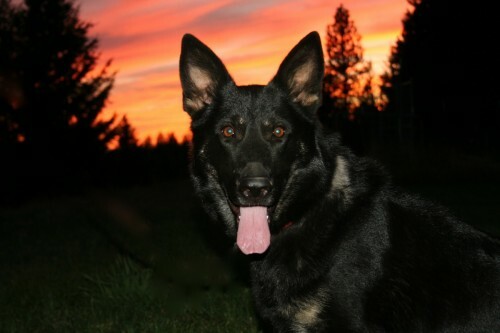 Mica, herself, is a very loving dog, highly intelligent, with strong nerve and good courage. She is being trained in Search and Rescue. It won’t surprise me at all, given her temperament, if she also finds a role in comforting family members as she is a dog with a big heart.